It was here, in this now National Historic Landmark, that William C. Durant fashioned his highly successful carriage company experience into the foundation for the General Motor Corporation. In 1906, as the Durant-Dort Carriage Company Headquarters, nearly 1000 workers crafted 50,000 vehicles including the famous and popular “Blue Ribbon” line. Motor Company a success, leading the way to the creation of the General Motors Corporation. the two created the Flint Road Cart Company which would become one of Flint’s largest Carriage Company’s and were millionaires within ten years. They believed that in order to have a successful company, they needed to control the supply of parts for their product. They erected factories to produce the supplies they needed and purchased tracts of timber to assure a quality product . The name of the company was changed to the Durant Dort Carriage Company in the 1890’s. J. Dallas Dort, the company’s President stood out as a man of compassion and one who was dedicated to his community. He helped form the Vehicle Factory Mutual Benefit Association in 1901 to provide insurance to his employees, believing that the character of a City’s development depended entirely on the way in which the city and industries took responsibility for the health and welfare of its workers. He personally contracted for a master plan for parks in the City of Flint and went about acquiring property for them. The Carriage Company donated land for a park , school and churches near the new Buick factory. William C. “Billy” Durant was the super sales person. He was able to sell carriages before he even had a factory to make them in. He was a complex person who spoke in a soft voice. He was a visionary who was often labeled a genius, dictator, and gambler. Had it not been for him General Motors surely would not have been developed. Many feel that had it not been for him there would not have been Buick, Chevrolet or Oldsmobile. Durant officially left the Carriage Company in 1913 to pursue his automobile interest having spent most of his time away from the company for many years. Dort was impressed one day by a young man who was working in his yard. He offered Charles Nash a job at the factory stuffing seat cushions for a dollar a day. Charles would become a model employee that rose through the ranks quickly. He went on to become President of Buick and then President of General Motors when Durant was removed. He left General Motors in 1916 and purchased the Jeffry’s Company, renaming it the Nash Automobile in 1917. Charles Nash’s first home in Flint is located across the street behind the office building. The Durant-Dort Carriage Co. experimented with the horseless carriage in 1912 with the Flint Truck. They began making the Dort Automobile in 1915 and officially ended carriage production in 1917. Automobile production ended in 1924, shortly before the sudden death of J. Dallas Dort. Blighted and decaying the Flint Bi-Centennial Commission identified the need to preserve this National Treasurer and an anonymous donor stepped up to provide the funds to purchase the building. 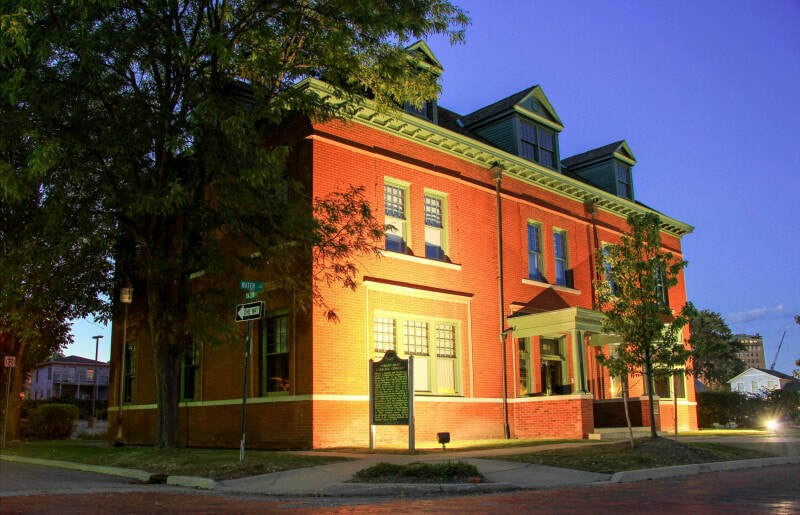 The Genesee County Historical Society stepped to the plate to oversee its restoration, a project that would take 10 years. With a roof leaking completely to the first floor, painted brick and broken windows, the job was a big challenge. The community donated over $850,000 to restore the building and the National Park Service designated the building a National Landmark, the highest distinction given to a historic building in America. The Building has been a home to numerous non-profits since the restoration was complete in 1986 in time for the 100th anniversary of the company. The Flint Area Chamber of Commerce was the first tenant . Flint Community Development Corporation used the building following the chamber. The Flint Area Convention and Visitors Bureau and Attorneys followed them. In 2013 thanks to a contribution by the General Motors Corporation, the building is slowly being turned into a museum/historic site.